Have I mentioned that little tidbit recently? grumble grumble. I pray it's just the camera battery has finally died of old age.... I've been using my DD's point and shoot to take photos the last week... ugh. I really REALLY miss my Rebel. 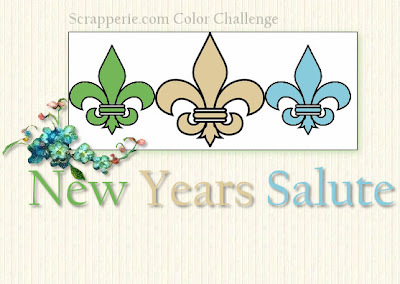 In other news.. today is Colorriffical FUN friday... grab your scrappy supplies, because this color challenge is perfect for closing out January, and the start to 2010. 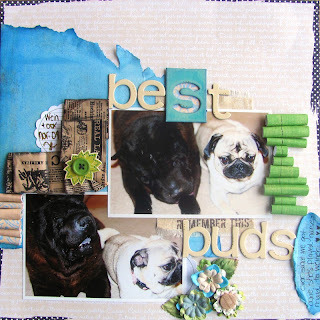 Anyways, HOP on over to Scrapperie and check out the color challenge, as well as all the other challenges listed daily... tons of scrappy inspiration to jump-start your creativity! Had the scare of my life yesterday. gahh... I feel all panicky thinking about it... and wishing I had grabbed a photo at the same time... I was downstairs switching out laundry when Samantha yelled down to me, "Mama... Cameron is crying!!!" Me: Why is Cameron crying? Samantha: Cuz he stuck something in his nose and can't get it out! Me: CRAP! I busted a move upstairs quicklike and there he was.. blood coming out his nose and tears streaming down that sweet little boy face. I scooped him up and sat him on the kitchen table and asked if he could breathe. He nodded his head up and down saying yes. Phew. I ran to the bedroom to grab Kleenex, tweezers, and a flashlight. The flashlight we have is the kind you shake.. it's cool because it doesn't require batteries.. it's NOT cool though when you have to take the TIME to shake it. Finally got the flashlight shined up his nose.. and I see something in his left nostril. It looked shiny.. like a diamond. I was thinking to myself.. is it a diamond? Crap.. time to dig in there for that sucker. I grabbed the tweezers and looked Cameron in the eye... it's very important you don't move, ok?! He nods. Deep breath. Hold my breath... and reach in. I grab hold of shiny object in Cam's left nostril, push tweezers tight together, and pull. OOPS. The sucker slips back a little further in his nose. I had an idea that was going to happen, but I had to try before rushing off to the Emergency Room. I told Cam I had to call Daddy, and said let's get you off the table. He made a funny face.. like he was going to sneeze. I scooped up a wad of tissues and put them up to his nose real quick.. ACHOOOO... and into the wad of was something heavier than snot. I peeked in and there sat.. can you guess? Where the heck did that come from? We don't even wear watches. I was just relieved that object came out. Funny how it resembled diamonds in his nose, and outside it was well.. it was gross. A snowstorm is coming in tonight.. yay!! !